According to Gazprom’s Q1 2017 results disclosed May 31, “net sales of gas to Europe and other countries decreased by 10% in ruble terms compared with the same period of the prior year. This was mainly driven by the decrease in average ruble prices by 20%, that was partially compensated by the increase in volumes of gas sold by 13%, or 7.5bn m³”. In dollars, the price of Russian gas sold in Europe rose by 2% to $191/'000 m³ and the guidance provided for 2017 European prices is still between $180 and $190/'000 m³ with some upside in volumes versus 2016. Russian gas into EU grew again (+5%) thanks to less gas transiting to Turkey (-11.6%). From 1 January to May 30 Gazprom supplied 22.3bn m³ of gas to the German market, which is 3bn m³ (15.7%) more than in the same period of last year. In EU-27, Germany saw the highest growth in volumes (+4.5bn m³ in 2016 vs 2015). This trend in Gazprom’s biggest EU market should therefore continue in 2017. Gazprom used all routes more – Ukraine (+7.1% in May vs April), Belarus (+3.8%) and the direct links (+2.6%) – and Gazprom management in the Q1 conference call mentioned that the company is still optimistic about the possibility of using more capacity in Nord Stream 1. The court case between Poland and the European Commission over the latter's decision to lift the ceiling on the Opal capacity use – which directly affects how much gas may flow through Nord Stream – is continuing in Dusseldorf. Poland claims the decision is not legal. 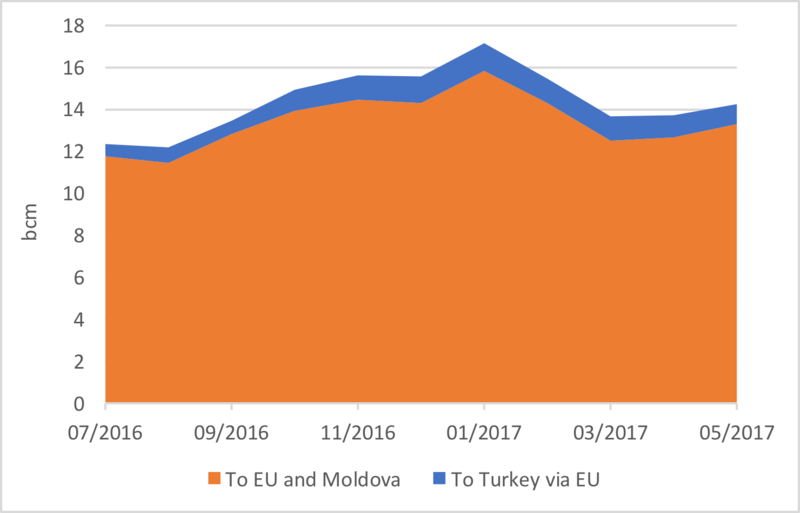 As Gazprom Export recently released its exports on a per country basis, we can now split the record 2016 exports in 151bn m³ for EU and 25bn m³ for Turkey. As expected, the price attractiveness of Russian gas relative to US LNG, and reduction of output from Groningen, leaves EU more dependent on Russia. EU is now 33% dependent on Russia (vs 30% in 2015). That percentage will rise once the UK, still a large gas producer, has left the EU. The EU-27 were 35% dependent on Gazprom in 2016. 2017 should see even more Russian gas entering the EU energy mix as the Dutch government is planning to reduce further the Groningen cap by 10% to 21.6 bcm for gas year 2017, beginning in October. On a foreign policy side, Russia is not an EU friend, but on the energy side Gazprom is the cheapest gas supplier than can, on top, provide any additional gas we may need. With increase interdependency, how is Europe’s schizophrenia going to evolve? Stay tuned!